I do not know what to do ... "Rude question" vs "over interpretation"
Hollywood actor Suh Hyun has been racially discriminated in a local interview. 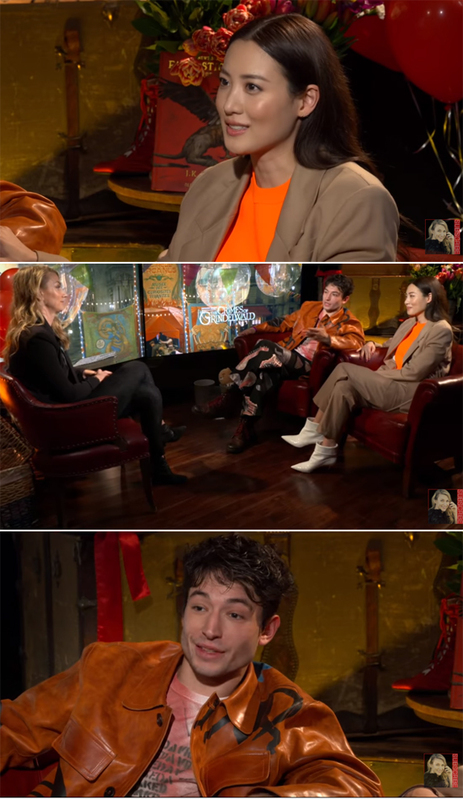 Kirsty Plas posted an interview on June 6 with his wife, Ezra Miller and Suh Hyun, the main characters in the movie "Mysterious Animals and the Crime of Grindelwald" on their YouTube channel. Hollywood actor Suh Hyun has been racially discriminated in a local interview. Kjersti flaa posted interviews on his YouTube channel with Ezra Miller and Suh Hyun, the protagonists of the movie "Mysterious Animals and the Crime of Grindelwald", on June 6 (local time). As an interviewer, Kirsty Flore asked, "Do you remember the first time you read a Harry Potter book?" Ezra Miller replied, "My father read it by the age of seven," and Suhyun replied, "My middle school boy told my friend in the United States to send me a book." The interviewer listened to Suhyeon 's answer and said, "Did you read in English, then you could speak English?" Suhyeon said, "Yes," Kirstyplain responded, "Then you did well in English. "Even now, I am very good at English," said Ezra Miller. Kirstyplain responded, "Yes, it is impressive." Ezra Miller said, "It 's cool, I can not speak English, my Korean is a mess." The interviewer said, "Mr. Suhyeon can teach me," and Suhyun replied, "Ezra do good." At this time, Ezra Miller said in Korean, "It was a big hit," "Did you eat rice?" Kirstyplain could not understand this word and tried to move on to the next question. Did you speak Korean now? "Ezra Miller replied," Yes. You did not think I was muttering like I usually do during an interview? I did not speak the language, I spoke Korean. "The embarrassed interviewer responded," How to fix this situation. " At this point, Ezra Miller said, "I should finish the interview." The embarrassing interview responded, "Oh no," and Miller replied, "It is a joke." The interviewer said, "I have more than three minutes to complete the interview." Ezra Miller said, "Mr. Suhyun is smarter than me (next question), please do to Mr. Suhyeon." He wanted to give him more interview opportunities. After seven minutes of interviews, it was racially disputed among Korean fans. The interviewer claims that he asked questions because he thought that he could not speak English because he was a Korean. Although the United States is a multi-racial country, it is still criticized for its bias toward Asian or black people. On the other hand, there is a reaction that is too much interpretation. It is an opinion that the interviewer is a mere surprise about the fact that the Korean people read 'Harry Potter' in their original language without knowing that Suhyun was living in a foreign country. There is an unseen air in the interview room. Suhyun was interviewed rather than usual, but he can get a glimpse of Ezra Miller's actions. The intention was to intimidate an interviewer who was surprised by Suhyon 's English language ability to lower his / Furthermore, Ezra Miller was looking to give Suhyun more opportunities to speak throughout the interview. Ezra Miller is a young actor from Hollywood who shows off his explosive acting skills in the movie "Kevin" (director Rin Ramsey), which was unveiled in 2012. In 2017, he became a global star in the 'Justice League' as a flash player. He is also ahead of the release of Flash's solo movie 'Flashpoint' following 'Crime of Mysterious Animals and Grindelwald'. 'Curious story Y' Child abuse, confinement, assault, secrets of King's School ... "Have a pee."